The year started with a lot of turbulence in the stock market. Banks and Offshore Marine Sector stocks are the most impacted, trading at prices last seen during the Lehman Brothers crisis. Many REITs in my portfolio have announced their results for 4Q2015. 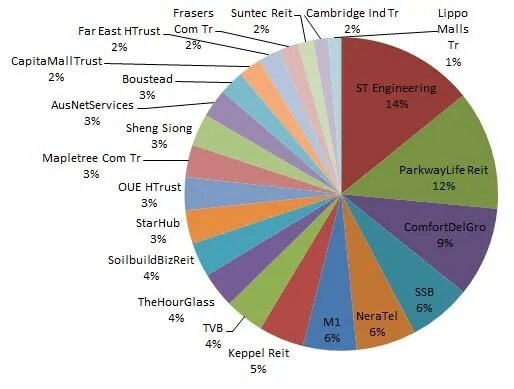 Some REITs Distribution Per Unit (“DPU”) increases (Frasers Commercial Trust, Soilbuild REIT) while some REITs Distribution Per Unit (“DPU”) fell (Keppel REIT, Cambridge Industrial Trust, OUE Hospitality Trust). Applying the average down strategy, I add more of Keppel REIT and Soilbuild REIT. The stock prices for most REITs are falling. At current levels, I feel that the yield is attractive enough to top on more of the REITs although I expect prices to fall further. Based on the market closing price of S$0.77 on 31st December 2015, the yield for Soilbuild REIT is 8.42% for year 2015. Based on the market closing price of S$0.93 on 31st December 2015, the yield for Keppel REIT is 7.30% for year 2015. I added more of ST Engineering as its price fluctuate between S$2.82 to S$2.90. I stick to my personal analysis here (My Personal Analysis of ST Engineering). I checked that there are currently no negative news about ST Engineering and thus I will think ST Engineering is probably affected by the downtrend of oil prices. I divested all my stake in SMRT although SMRT has claimed to make a profit in 3Q2016 (SMRT Non Fare Business Saved The Day). According to charts, SMRT is on a long term downtrend. Given the recent rise in prices, I decided to sell off all my stake in SMRT. My strategy is such that if prices drop further below S$1.30, I may accumulate back SMRT and wait to sell it when prices rebound. This is usually not my strategy for investing but I am familiar with SMRT after holding on to it for many years (I can be wrong!). For those who have never invested in SMRT, I advise investors to stay clear of this stock. ST Engineering is now my largest share in my portfolio. In the current bear market, I shall be holding on to cash, accumulate payouts from the REITs in February and invest prudently. OUE Hospitality Trust announces its results for 4Q2015 on 25th January 2016. DPU fell 4.5% to 1.70 cents as compared to 1.78 cents in 4Q2014. Distribution income was $8 million lower than 4Q2014 due to lower contribution from Mandarin Orchard Singapore and Mandarin Gallery. OUE Hospitality Trust focuses on Hospitality and Retail sector. Its hotel properties consists of Mandarin Orchard Singapore and Crown Plaza Changi Airport. Its retail properties consists of Mandarin Gallery. From the above figures, we can see that gross revenue is $2.6 million higher than 4Q2014. Hospitality segment posted higher revenue which offset the lower revenue from the retail segment. The master lease income contribution from Crown Plaza Changi Airport added $4.0 million of hospitality revenue. 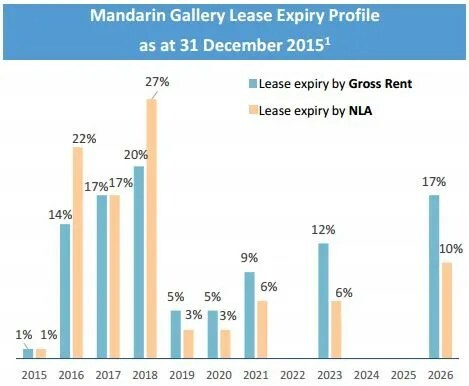 Master lease income from Mandarin Orchard Singapore was $1.1 million lower than 4Q2014 mainly as a result of lower room sales and lower Gross Operating Profit (“GOP”). Retail revenue was $0.3 million lower than 4Q2014 mainly due to lower occupancy and fit-out periods for tenants arising from lease renewals. OUE Hospitality Trust has a high gearing ratio of 42.0%. The average cost of debt is 2.7%. The weighted average lease expiry by gross rent is 4.5 years. The weighted average lease expiry by Net Lettable Area (“NLA”) is 3 years. 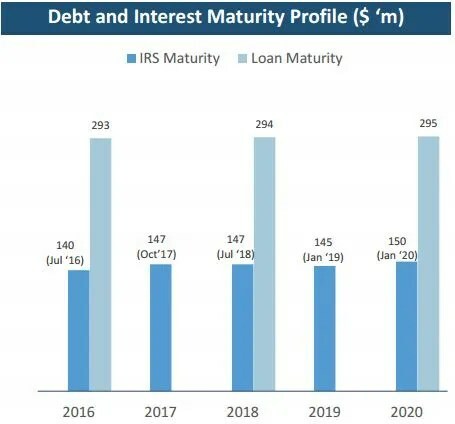 From the statistics below, we can see that majority of the leases are expiring between the current period 2016 to 2018. 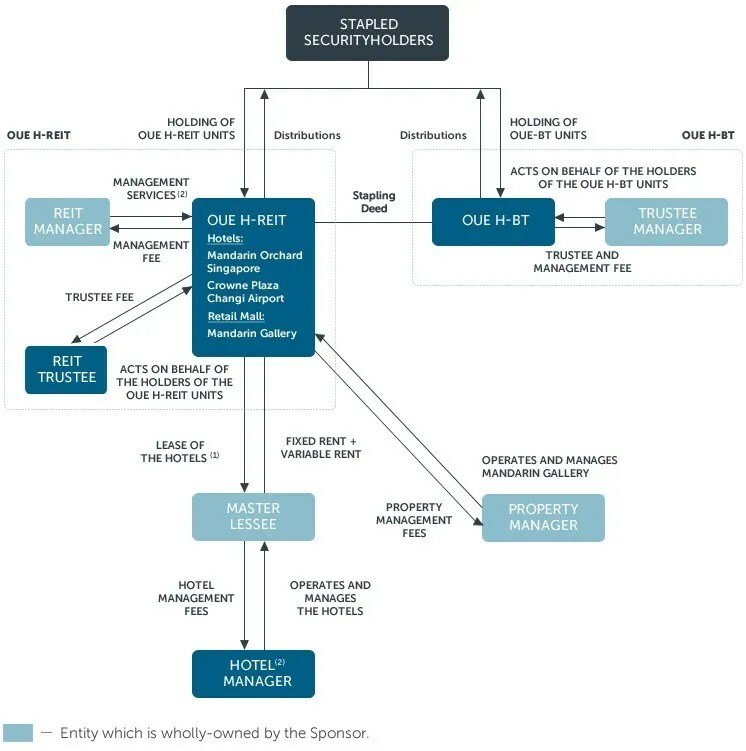 OUE Hospitality Trust is currently trading at S$0.77 (As at 31st December 2015) 14% discount to NAV of S$0.90. Singapore will again host major biennial events such as The Singapore Airshow and Food & Hotel Asia in the first half of the year. It will also be the first year that the country will host the World Rugby Sevens Series in April 2016. These events are expected to increase hospitality demand. Two international brands Michael Kors and Victoria’s Secret have signed a seven years and ten years lease with Mandarin Gallery respectively.